You’ll wake up in the morning and call across the room to your smart assistant device to read you the day’s headlines, prioritized by your preferences. While you’re eating breakfast your assistant notifies you that it’s time to take your car in for an oil change, so you pull up the digital twin of your car on your tablet to see if there are any other problems. You’ll go to work and interact with an Internet of Things deployment that your company uses for operations, then make decisions with the help of AI. After work, you head to the mall to pick up a gift for your spouse (even though you’ve been talking to bots more often lately). You don’t know anything about jewelry but you put on an augmented reality headset that provides you helpful information. Before you go to bed that night, you check the data from your fitness tracker to see if you hit your targets. Then you dream of digital sheep. Though Gartner rates its prediction accuracy at 78 per cent since 2010, so there’s a chance it’ll be a bit different. And while it’s releasing predictions for 2017 here, they are really guidelines for what might happen over the next few years. Plus, Gartner isn’t predicting ho-hum incremental changes here, but disruptive change. 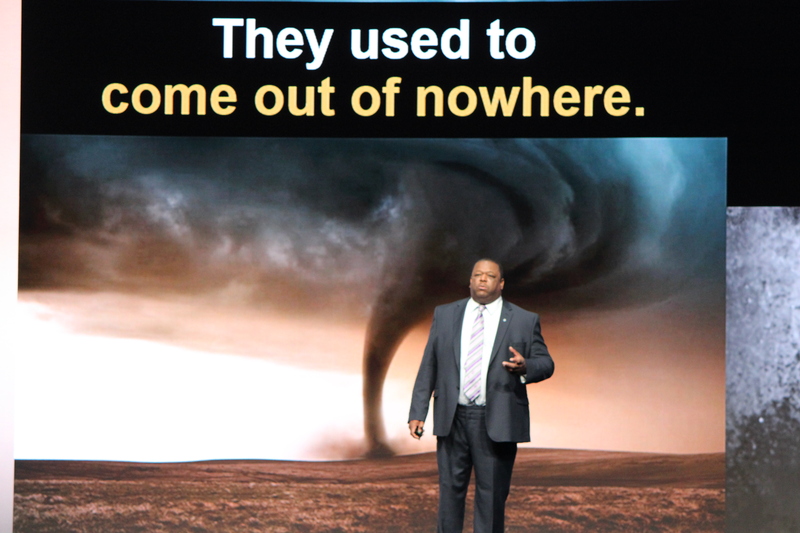 As Daryl Plummer, vice-president and research fellow at Gartner, described it to an audience, disruptive change is more like the hurricane that causes damage across a wide area than a tornado that destroys a specific region. With that image of destruction in mind, let’s plunge into the predictions. Thanks to Pokemon Go, we’re well familiar with AR technology now, Plummer says. One of the first commercial applications that will make sense for the technology is to handout headsets to shoppers as the enter retail locations. That will provide contextual information about the products they’re browsing – no need for a pesky sales rep. Expect to see retail leaders deploying this in 2017. How, you ask? With voice-activated systems like Amazon’s Alexa or Apple’s Siri. In fact, this mode of accessing information on the web will become so prevalent that the average person will have more conversations with a bot than with their spouse in an average day. Building apps was all the rage a couple of years ago, but now we’re all burned out and app usage on our devices is dropping off. Instead of asking end users to update apps on their devices, Gartner recommend pushing out “instant apps” via a web browser. “Apps are going to influence you to do the right thing,” Plummer says. For example, AI is already helping pilots do the most fuel-efficient thing and helps financial advisors steer away from advising on bad investments for their clients. The first area your company might be able to use AI? Retaining your best talent by using algorithms to detect those at risk of leaving. By 2017, businesses will see an increase in profit margins directly related to positive employee behaviours influenced by AI. Gartner’s Daryl Plummer says the consultant firm focuses on predicting disruptive change. Don’t look now, but the Tapscotts might be on to something. The implications could apply across several industries that see a lot of transactional friction right now, including healthcare, real estate, and finance. In 2017, expect to see the deployment of multi-modal blockchains begin. You know who they are. Google, Apple, Facebook, Amazon, Baidu, Alibaba and Tencent. Businesses will have to decide if they’re going to partner with one of these digital giants, or fight against them. Either way, chances are that you’ll interact with at least two of them from your kitchen by the end of 2017. This prediction addresses Gartner’s assertion that a proper IT strategy takes a bi-modal approach, combining the mode one approach of cost-cutting and maintaining systems, and the innovation that business units are demanding with consumer-grade cloud apps. There’s a lot of talk about all the new data influx coming from the sensors and Bluetooth beacons are bound to deploy. But in the end, that data can be run pretty efficiently and IoT solutions will come paired with smart systems that will automatically expunge unneeded data. An early application that will be realized from IoT is the ability to create a “digital twin” of a real-world vehicle or piece of machinery. Businesses should be exploring areas where they can cost-cut with IoT and set a 10 per cent target, Plummer says. “You can cut your company’s healthcare costs and you can cut the number of things that go wrong with you,” Plummer says. It’s a win-win scenario, and besides, healthcare costs in the U.S. are outrageous. So you’ll wear that Fitbit and you’ll like it. Watch for multi-national corporations to sponsor the use of wearable fitness tracking in 2017.